UFC Bantamweight Champion, TJ Dillashaw, is on his way to challenge for the UFC Flyweight Title in a matter of days, when he faces Henry Cejudo at UFC on ESPN+ 1: Cejudo vs Dillashaw. However, even before he can reach that fight, his Head Coach, Duane Ludwig, has more ambitious aspirations for him to meet. Before Dillashaw can challenge for the UFC Flyweight Title, Ludwig might be looking to the future for a fight at a higher weightclass. 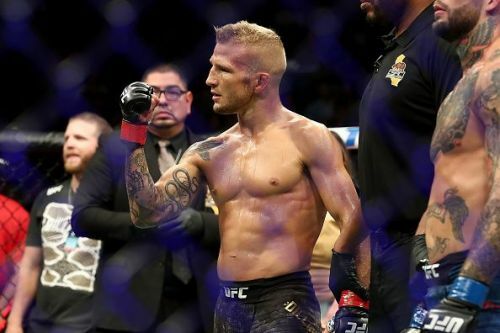 UFC Bantamweight Champion, TJ Dillashaw, is looking to become the fourth person, and third male UFC star to be the Champion of two divisions simultaneously. Aiming to win the UFC Flyweight Title, Dillashaw will join the ranks of Conor McGregor, Daniel Cormier, and Amanda Nunes, as the only UFC Fighters to hold the belts of two divisions simultaneously. There were rumors that Dillashaw winning the Flyweight Title was UFC's method to shut down the Flyweight Division, something they were rumored to be trying. However, since then, they have signed Joseph Benavidez to a four-fight contract, which does not need him to move up a division, and expects him to fight at Flyweight. This could mean that the UFC has no plans in shutting down the division in the near-future after all. Duane Ludwig was on Ariel Helwani's MMA Show podcast, where he talked about future aspirations for the UFC Bantamweight Champion. On the podcast, he talked about Dillashaw wanting to become a Triple Champ and said that he was always up for new challenges. "There are still credible opponents at 135, but to cement our legacy and see what our true potential is as a human being and martial artist, why not test ourself also at 145?" TJ Dillashaw’s head coach @DUANEBANGCOM has legit plans to see Dillashaw fight for the 145 belt soon. Champ champ ... champ? If Dillashaw can win the Flyweight Championship this coming Sunday, then a move to the Featherweight class might be his next goal if his coach is to be believed. UFC Fight Night 143, also known as UFC on ESPN+ 1: Cejudo vs Dillashaw is set to take place on the 19th of January, where Dillashaw will test his ability against the Flyweight Champion and take the next step to fulfill the dream of becoming the Triple Champion.